State of Wales has long standing historical and political commitment for Sustainable Development – with latest royal assent for the Well Being of Future Generations (Wales) Act 2015. It is a part of ‘Prosperity for All’ strategy and includes well-being goals and sustainable development principles and well-being duty – on Welsh Government. 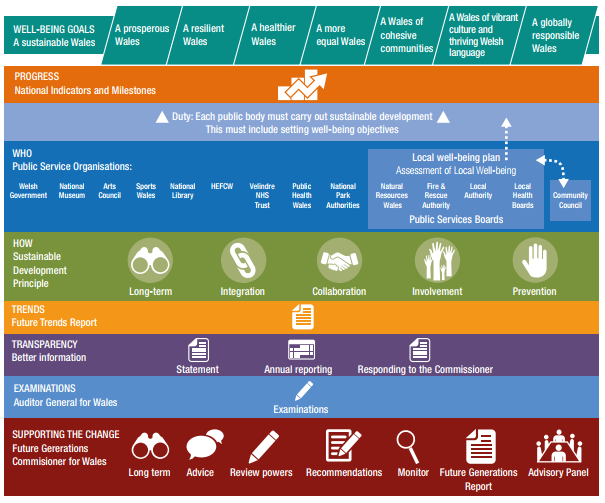 Welsh HiAP commitments are contained within Public Health White Paper (HiAP/HIA), which focus is on providing support for social sustainability and equity (NHS 1948, Now-different policies in UK). Challenges Welsh government is facing in practicing HiAP are: short term thinking versus long term trends and challenges; working in policy and organisation silos; separate solutions to common problems; greater awareness of connections between issues (environment, economy, society); needs of whole populations. To access the case study on Welsh Health in All Policies Experience click here.